Generally, you will be able to resupply via a mailed package and/or purchasing food from a local store every 4 to 9 days along the GDT. Some resupply locations are a short distance off-route which will add some distance and time to your hike. There are only two places directly on the GDT with stores that carry adequate food and supplies for long-distance backpacking: Waterton townsite and Jasper – so preparing resupply packages is an essential part of a long-distance journey on the GDT. While not directly en route, Blairmore, Pincher Creek, Banff, Lake Louise and Golden all have supermarkets and outdoor gear shops. There are small stores at Coleman, Boulton Creek Trading Post, Field and The Crossing Resort where limited food and supplies are available. When mailing resupply packages to yourself, be aware of the hours of operation for the resupply locations. You may find yourself racing to beat closing time, or waiting for it to reopen. Standard policy is that the packages will be held for 15 days so write “Please hold for Great Divide Trail hiker” with your anticipated date of arrival to ensure the package will be there when you arrive. Allow plenty of time for shipping as some remote locations may take up to two weeks to receive a package. You will need government issued photo id to pick up your package from most locations. For government Post Offices, mail your package general delivery. Ensure your resupply package is tightly sealed (i.e. mouse-proof) and contains no perishable items or hazardous materials. Large heavy packages might not be accepted. A good rule is maximum 25 lbs (11 kg) per package. If you are packing food for more than 2 people, split into 2 packages. If using a courier, only prepaid couriered packages will be accepted. Call or email in advance to confirm that the resupply location will accept your resupply package. For more information, including a list of resupply locations with addresses and telephone numbers, check out our Resupplying page. There are many campgrounds along the GDT. Hikers must stay in designated campgrounds on most sections of the GDT in National and Provincial Parks. Random camping is authorized in some areas within National Parks (e.g. Amiskwi valley in Yoho, Howse Pass Trail in Banff) and is an acceptable alternative almost anywhere outside of National and Provincial Parks. All of Section F except for the Berg Lake Trail in Mount Robson Provincial Park, and not along Highway 16. All of Section G except for the short section of the North Boundary Trail in Jasper National Park. Check out our Campgrounds page for a list of campgrounds along the GDT. Do I need a permit? How do I get one? Yes, GDT Hikers must stay in designated campgrounds in most National and Provincial Parks so it is recommended that you arrange for all park permits and reservations in advance. A National Park Backcountry Permit is required for any overnight stay in a National Park. Backcountry Permits require a complete selection of all backcountry campgrounds and random camping locations (where applicable) to be used on your route, and are subject to campground availability. Banff, Jasper, Kootenay and Yoho national parks now accept online reservations starting in January. The exception is Waterton Lakes National Park where reservations can be made up to 90 days in advance via telephone. Hikers planning a long-distance trek through multiple National Parks will likely have to contact each Park office separately to make all required campground reservations. Random camping is allowed on the following sections of the GDT within National Parks but a Backcountry Permit is still required: Amiskwi valley in Yoho; Howse Pass Trail and Owen Creek Trail in Banff; Miette River/Pass Trail, Calumet-Moose Pass Trail, 6-Passes Alternate and Elysium Pass Alternate in Jasper. Making all campground reservations in advance of a thru-hike can create obvious challenges trying to stay on a defined schedule when hiking several months later, but do your best to create a realistic itinerary, include flexibility in your schedule, and if you get ahead or behind schedule while hiking, talk to a Park warden about revising your permit. Outside of National and Provincial Parks, permits and reservations are not required on the GDT. For more detailed information on how to reserve a permit including links, telephone numbers and email addresses, check out our Permit page. What should I contact Parks Canada about? Reporting wildlife sightings or incidents within National Parks. All other questions about the GDT can be directed to the GDTA. How are campground reservations made outside of national parks? Most Provincial Park backcountry campgrounds do not take reservations and have first-come first-served self-registration. The exceptions are in Peter Lougheed Provincial Park, Mount Assiniboine Provincial Park and on the Berg Lake Trail in Mount Robson Provincial Park where backcountry campgrounds reservations are required. For more detailed information on how to reserve a campground including links, telephone numbers and email addresses, check out our Permit page. Yes, Hiking Canada’s Great Divide Trail (third edition 2017 – Revised and Updated) by Dustin Lynx. The guidebook is an excellent resource for anyone planning to hike the entire trail or only a section. Outlining the six major sections of the GDT, the guidebook breaks the trail into shorter, more attainable segments and thoroughly describes the terrain and condition of each. Not only are these trail segments invaluable for planning shorter trips along the GDT, Lynx’s pre-trip planning advice will also prove indispensable for long-distance hikers overcoming such daunting logistical challenges as resupply, navigation and access. The third edition comes with colour photos, detailed maps and updated information to help hikers piece together the myriad of individual routes that form a continuous trail along the Great Divide. No. Except for portions of Section A and B (between Waterton and Kananaskis), the GDT is not officially signed and the route is actually made up of several separate trail systems joined together by ATV tracks, roads, and wilderness routes. The GDT varies from being a well-developed, blazed trail to an unmarked, cross-country wilderness route where navigation skills are required. Do I need to bring maps and/or a GPS? Yes, always bring a map and a compass and know how to use them. Consider bringing a GPS or satellite-based communication device such as SPOT or Garmin inReach. Check out our map page for a GPS based map of the entire trail. The detailed descriptions in the guidebook can also be helpful in keeping you on track. Because weather and trail conditions are always changing, it is best to research your route from as many sources as possible; don’t rely on a single source and be prepared to improvise. Another option is the Great Divide Trail App by Atlas Guides, a GPS map-based hiking guide for smartphones and tablets. The App works in airplane mode. No mobile service or internet is required after initial setup. The app uses your device’s built-in GPS and downloaded topographic maps. We recommend that you always bring a paper map and compass even if you have the GDT App (because a map’s “battery life” is significantly longer than that of a smartphone). Is the GDT marked on maps? Yes, the GDT is marked on several maps, including the Gem Trek series, Backroad Mapbooks and Ryan Silk’s GDT Map Atlas. Is there a GPS track available for the GDT? Yes, check out our map page for a GPS based map of the entire trail. A KML file for the GDT can be downloaded and easily converted to GPX format for use on GPS devices. How difficult is the GDT? Due to the remoteness of the GDT, self-sufficiency is required. Safety is your responsibility and should be your top priority. Preparation is key to a successful hike on the GDT. Research your trip to be sure you have the skills and experience it will demand of you. Know your personal limitations and stay within them. Training in wilderness navigation, first aid and survival are recommended. How difficult are the river and creek crossings? Many streams along the GDT are glacial fed which means their volume can fluctuate significantly during the day. Plan to ford hazardous river and creek crossings early in the morning when they are at the lowest level. Depending on seasonal water levels and the time of day, the following rivers and creeks can be challenging to ford: Alexander Creek (b6), Aldridge Creek (b32), Palliser River (c4), Amiskwi River (d3), Cairnes Creek (d9), Lambe Creek (d10), Howse River (d13), Cataract Creek (e9), Maligne River (e23), Miette River (f4), Moose River (f12), Smoky River (f16), Gendarme Creek, Carcajou Creek, Chown Creek (near g2), Jackpine River (g8) and Buchanan Creek. What do I need to know about wildlife safety? What about bears? Beware of all wildlife hazards. The Canadian Rocky Mountains are home to both grizzly bears and black bears. Although the chances of having an encounter with an aggressive bear are low, proper planning before you head out can help reduce your risk. Most National and Provincial Park campgrounds have bear poles or secure food lockers. Bring a rope to hang your food elsewhere or consider using a bear canister or Ursack. Carry bear spray and check out Parks Canada’s “bear-aware” safety tips, including how to travel safely in bear country and how to use bear spray. What are Alternate Routes and how difficult are they? Alternate Routes leave the main route of the GDT at one point and rejoin the trail farther on, usually providing an alternative to road walking or overgrown valley walking. In most cases alternate routes are unmaintained trails or routes that are more difficult than the main route of the GDT (sometimes significantly so), occasionally involving scrambling beyond the scope of regular hiking. Hikers that choose to take an alternate route should be comfortable scrambling while carrying a heavy backpack. Because many alternate routes are off trail and at higher elevations, good weather conditions are strongly recommended. Off trail alternate routes can require significant navigation skills, especially in poor weather. Mount Rowe to Sage Pass – moderately difficult cross-country ridge walk, literally on the Great Divide. Barnaby Ridge – very difficult alpine route (includes sections of moderate scrambling) with limited water sources, but significantly more scenic than the main route in the valley below. Only attempt in good weather. Blairmore – easy road walk if you plan to resupply in Blairmore. Coral Pass – very difficult trail/route with a potentially dangerous river ford, strenuous cross-country climb over a high scenic pass, some moderate scrambling and challenging route finding. Recommended only in good weather. Northover Ridge – exceptionally scenic, difficult alpine route with sections of exposed scrambling and extended ridge walking directly on the Great Divide. Only attempt in good weather and no/low wind conditions. Kiwetinok Pass – offers spectacular alpine hiking on mostly good trail with different challenges than the overgrown valley bottom trail, including significant elevation change over 4 passes and 7 km of off-trail route finding. 6 Passes – scenic cross-country alternative to the decommissioned and overgrown Maligne Pass Trail. Requires some easy scrambling and route-finding skills. This is caribou country so dogs are not permitted, hikers only. Wabaso Lake – alternate lower trail to Jasper if weather or lack of campground availability restricts access to the Skyline Trail. Marjorie-Dorothy Lakes – avoid highway-side walk on mostly easy trail with a short moderate section of bushwhacking. Elysium Pass – for experienced thru-hikers that crave the high alpine, cross-country travel and remote wilderness. Dogs are permitted here as well as horses. Requires serious route-finding skills, bushwhacking and some moderate scrambling. Mount Robson – original northern terminus of the GDT, easy hiking on spectacular trail. Perseverance High Route (Jackpine Mountain Trail to Meadowland Creek) – difficult alpine scrambling route. More scenic than the main route in the valley below but plan for twice as long. Recommended in good weather only. Return to GDT via Meadowland Creek valley is possible. Perseverance High Route (Meadowland Creek to Little Shale Hill) – very difficult alpine scrambling route. Scrambling or climbing experience required. Only attempt in good weather. Surprise Pass High Route – moderate alpine scrambling route. Recommended in good weather only. Providence Pass High Route – moderate cross-country route. How long does it take to hike the entire trail? 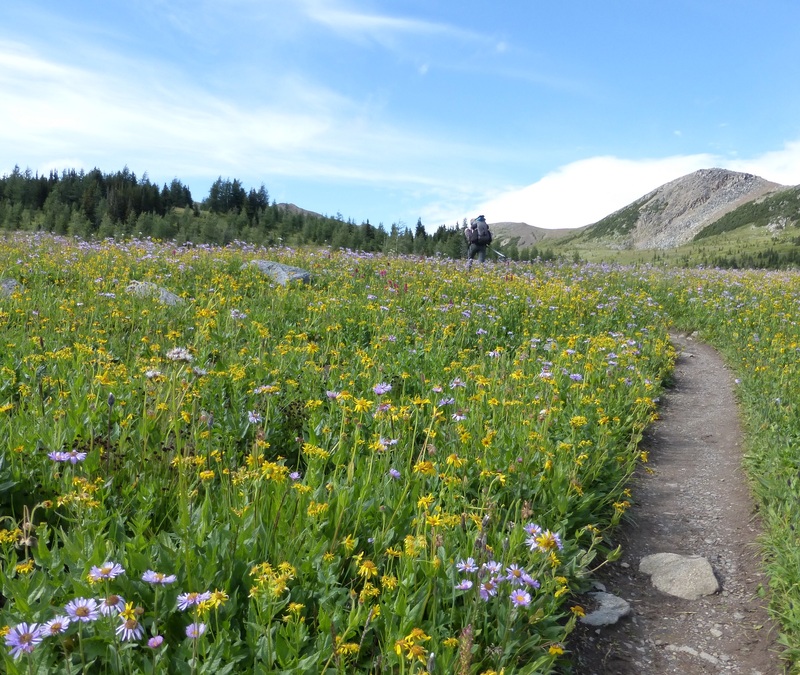 A safe estimate for hiking the Great Divide Trail is eight weeks. The total time to hike the entire trail from Waterton Lakes National Park to Kakwa Provincial Park is dependent on individual hiking pace, planning and selection of routes. The best word to describe the weather in the Canadian Rockies is variable. During the typical hiking season you can have lows of -5°C (23°F) and highs up to 30°C (85°F). Days can start out with clear skies then cloud over and give you an afternoon rain shower, and clear off for a crisp night. At higher elevations, snow can fall at anytime of the year. Overall most people would describe the GDT as colder and wetter than they expected so it’s best to prepare for that. Should I hike South to North or North to South? The trail can be hiked in both directions but most people will start at the southern end and hike north because it is warmer in the south which speeds the melting of the snowpack, freeing high passes on the GDT of snow earlier in the summer. As you travel north, the hours of daylight get longer increasing available hiking hours. The starting date of a north to south hike will likely be delayed a week or two compared to a south to north hike to allow more time for snowmelt and improved trail conditions. What is the best time of year to hike on the GDT? Most people will start in late June or early July and continue into the middle of September on average. Some years you can hike snow free until the end of September but this is rare. Portions of the GDT within National Parks close during the winter but most of the trail remains open all year round. However, the GDT is not designed, nor intended, for snow travel. When the trail is covered in snow, finding it may be impossible. You’ll have to be an excellent navigator to follow the trail corridor when it’s covered in snow. Wildfire and flooding can also temporarily close sections of the GDT. Are there check-in points or registers along the trail? You will need to register with Parks Canada for backcountry permits for those sections in the National Parks, and with Peter Lougheed Provincial Park for backcountry permits in that park. Outside of the Parks, there are a few informal trail registers along the GDT (e.g. Baril Creek, White Goat Wilderness Area, the summit cairn on the highest point on the GDT) but most other areas don’t have check-in points and don’t require registration. It is always a good idea to tell someone where you plan to go and when you plan to return. How do I get to and from the trailheads in Waterton Lakes, Mount Robson, and Kakwa? Greyhound no longer offers bus service in Alberta so public transportation options to GDT trailheads are very limited. Airport Shuttle Express offers a shuttle between the Calgary Airport and the Prince of Wales Hotel in Waterton Lakes National Park. This shuttle continues on to Glacier Park Lodge in East Glacier, Montana for an additional fee. Tamarack Outdoor Outfitters offers shuttle service during the summer to and from the Chief Mountain border crossing, connecting Waterton Lakes National Park with Glacier National Park in Montana. There is no public transportation to Mount Robson or Kakwa Lake so you must make your own travel arrangements. Mount Robson Visitor Centre is easily accessible on Highway 16. Access to Kakwa Provincial Park is very remote via the Walker Creek Forest Service Road off of Highway 16. Walker Creek FSR is a rough and muddy dirt road and a 4WD high clearance vehicle is required. For more information, check out our Access page. Is access to water an issue? Access to fresh water is rarely a concern on the GDT but you should still boil, treat or filter all water before drinking. Two litres of water storage capacity is recommended. There are some high altitude sections of trail, particularly on ridge crests, where water may be scarce late in the season, so fill up water bottles whenever possible. Plan for enough water to accommodate additional requirements due to heat, cold, altitude, exertion, or emergency. Always consult your map or guidebook for distances between available water sources. Will I need any technical gear, e.g. ice axe, crampons, climbing rope, skis or snowshoes? No, the route is designed within the scope of hiking so as long as you are travelling during the summer hiking season (July to September), you can leave the technical gear at home. Is there cell phone service on the GDT? Most of the GDT is quite remote and cell phone reception is almost non-existent, with the exception of the resupply locations on major highways. Consider bringing a satellite-based communication device such as a satellite phone, SPOT or Garmin inReach in case of emergency or if personal communication is desired. Because cell phone service is very limited and unreliable in the backcountry of the Canadian Rockies, an option for GDT hikers is to use a satellite-based communication device such as a satellite phone, SPOT Messenger or Garmin inReach in case of emergency. When using a satellite phone, dialing 911 may connect you to an emergency centre unfamiliar with your geographic location so be prepared to provide your exact location to the dispatcher. Depending on your location, help may be a long time getting to you so be prepared to self-rescue and to keep yourself and your partners warm and sheltered during the time it takes for a rescue team to reach you. How much will it cost to thru-hike the GDT? Not including costs for your personal hiking equipment and travel costs to and from the trail, a good estimate is $1-$1.50 per kilometre of trail to cover expenses for food, fuel and campground permits. There are only a half dozen resupply points where you could spend money on hotels and restaurants but they can be expensive tourist areas so it comes down to your level of budget control. How many people thru-hike the entire GDT each year? On average, fewer than 30 people per year attempt to thru‐hike the entire trail. So get out there and hike! Where can I find hiking partners? The best option is to join our Facebook Group “Great Divide Trail Hikers”. Where do I report problem trail conditions? Email the GDTA. Problem trail conditions within National Parks should also be reported to the respective Park office. Is the GDT designed for horse travel? Much of the GDT is designed for both hiking and equestrian use. However, some sections of the GDT are not passable to horses due to incompatible terrain or restrictions imposed by the National Parks. The GDTA is developing a Great Divide Alternate Horse Route that follows the hiking trail where possible and deviates where horses cannot travel. In order to create a mostly continuous equestrian route from Waterton to Kakwa, the route occasionally travels on gravel roads or in a few places, horses must be transported between trailheads to avoid travel on dangerous or prohibited roads. Generally the route is mostly good trail. Logistical details such as grazing areas and equestrian-friendly campgrounds have yet to be figured out. If you are interested in learning more about this beta route, contact the GDTA. Are dogs allowed on the GDT? Are there GDT ‘Trail Angels’? The GDT is not as widely known as the big trails in the USA (e.g. Appalachian Trail, Pacific Crest Trail) and travels through a sparsely populated area, most often far from any towns or highways. That being said, Canadians are known for their helpfulness so you could be the recipient of Trail Magic from someone who might not even be aware of the GDT. There are a few true Trail Angels out there, so if you need assistance the best bet is to simply reach out. Start by asking questions on the Facebook Group “Great Divide Trail Hikers” and they will help when they can. Are there any good lakes to swim in? There are numerous inviting lakes and creeks along the way, it all depends on your threshold for cold water as most of these are glacier fed. A few of the nicer lakes to take a dip along the GDT are (from south to north): Cameron Lake, Lone Lake, Twin Lakes, Chinook Lake, Lower Elk Lake, Og Lake, Howard Douglas Lake, Egypt Lake, Haiduk Lake, Floe Lake, Pinto Lake, Maligne Lake, Edith Lake, and Annette Lake.